Orbital ATK (NYSE: OA) is a global leader in aerospace and defense technologies. Headquartered in Dulles, Virginia, the company designs, builds and delivers space, defense and aviation systems for customers around the world. Having manufactured rocket motors for strategic, tactical and space applications, Orbital ATK is a leading producer of solid rocket propulsion systems. Its Propulsion Systems Division has manufactured rocket motors for the Minuteman ICBM system, as well as NASA’s Space Shuttle solid rocket motor program. Today, it manufactures the five-segment solid rocket boosters for NASA’s Space Launch System (SLS). These are the largest, most powerful solid-rocket motors ever built for flight. The 322-foot SLS, in conjunction with NASA’s Orion spacecraft, provides a flexible deep space exploration platform to transport humans and cargo to multiple destinations across our solar system. Each Booster, 177 feet long and 12 feet in diameter, includes the five rocket motor segments, thrust vector control and an aft exit cone assembly. A pair of the boosters combines with four shuttle main engines powering the rocket’s core stage. NASA’s SLS will produce 8.4 million pounds of total thrust when it blasts off from Kennedy Space Center in Florida. The first SLS launch is targeted to take place in 2018 – a flight called Exploration Mission-1 that will send an unmanned Orion crew capsule beyond the moon. Extensive testing of every component – under close-to real-life conditions – is imperative. Orbital ATK and NASA successfully conducted the second of two booster qualification motor tests for the Space Launch System in Promontory, Utah, June 28, 2016. This test aimed to qualify these solid-propellant boosters for flight, specifically focusing on the motor’s capabilities at lower temperatures under which the SLS may operate. The sensitivity of the energetic materials inside the rocket motor dictates an environmental seal that controls moisture levels while ensuring nothing (blown-in dirt, birds, etc.) can get in when the rocket is on the pad awaiting launch. The rocket motor needs to be protected while the core vehicle engines come to power. When the core vehicle engines start up, they produce hot gas and debris that could potentially enter the rocket motor and cause premature ignition. Also, the closure must withstand an oscillating load which comes from air turbulence and sound waves of the ignition environment. This drives the minimum strength of the nozzle plug. Based on previous successful product experiences the design engineering team looked at General Plastics’ high-density polyurethane foams and used our data sheets to identify the most promising materials for this barrier. 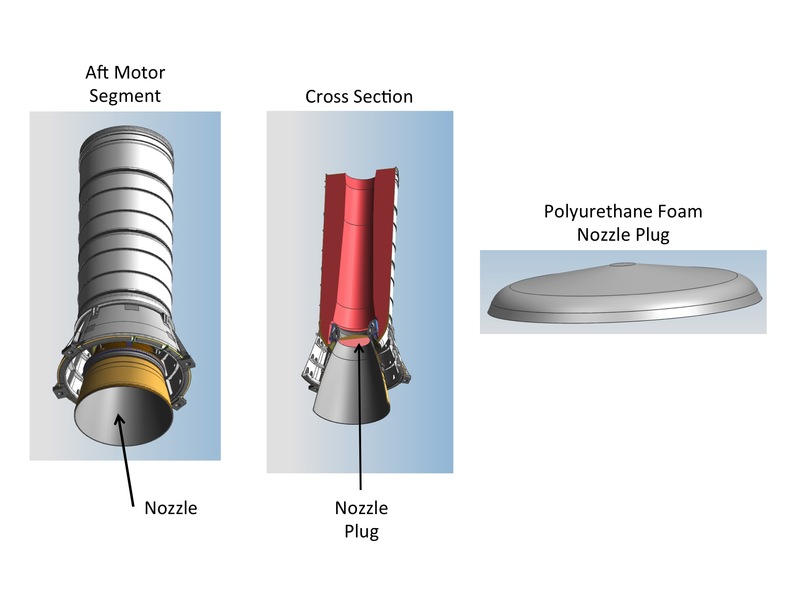 They selected several different formulations for testing prior to deciding on the LAST-A-FOAM® FR-4300 foam series, and incorporating it within the nozzle closures for the solid rocket boosters. Illustration provided by Orbital ATK. After first focusing on foam as the barrier solution, the team tested foam material from another supplier, however a satisfactory material solution was not reached. General Plastics’ LAST-A-FOAM® FR-4300 foam series material, a unique, flame-retardant structural polyurethane foam, proved ideal as nozzle closures for the solid rocket boosters. Its physical properties allow compound-curved surfaces and it had the tensile properties they needed with just the right amount of strength required for the application. In addition, General Plastics trimmed rough billet into the shape specified by Orbital ATK, and they machined the final shape at their facility. They wanted clean, virgin foam when they applied their coatings, so they removed the last bit of material with their own machine process and moved directly into their coating process. The final pieces were incorporated into the tested rocket booster. Following the booster qualification test, Orbital ATK disassembled the motor to see how it performed. They and NASA used test measurements to assess a myriad of factors and to determine the qualification success. Their engineers analyzed data collected from more than 500 sensors to determine that the 82 unique test objectives were met. As a result of its successful performance in this test, General Plastics’ LAST-A-FOAM® 4300 foam series material will be used on the first flight of the Space Launch System vehicle. Contact us today to learn more about our Flame-Retardant Thermoformable Board series.